Has anyone on this site ever seen one live and in person? Yeah, not a beautiful fish, to most, but really cool none-the-less! They are the larges of the boney-fish... totally boss! Have seen one in person coming back from Nova Scotia, off the Cape Hatters national sea shore on the Research Vessel Advance II. It reminds me of a AMC Gremlin were is the rest of the fish?? They are very large and they just float with the current most of the time. 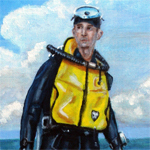 We were about 50 miles off shore just before we rounded the Cape. "It reminds me of a AMC Gremlin were is the rest of the fish??" Only a handful of people have done this: I've heard it called one of THE most difficult dives--PERIOD! Old post, I know, but I just read it. A friend has a house on the beach at DelMonte in Monterey. While playing beach petanque one afternoon we kept seeing dinner plate sized sunfish washed up on the beach. They were missing their tall fins and their eyes (at least on the top side--gulls I think). They numbered in the hundreds all along the stretch of beach. When we got back to the house, I looked it up. Apparently, sealions like to torment them and rip their fins off for fun. They don't eat them, or at least most of them. Helpless, the sunfish then washes in onto the beach. Some of the ones we saw were still alive. We see them often while diving Monterey. And yes, I've seen sea lions tossing them around like a frisbee. The best way to see them is to get out in the Bay a bit. That means a boat ride or maybe a kayak paddle. I read that Monterey Aquarium had one that grew so massive, so fast, they had to chopper it out of the tank and drop it in the bay! 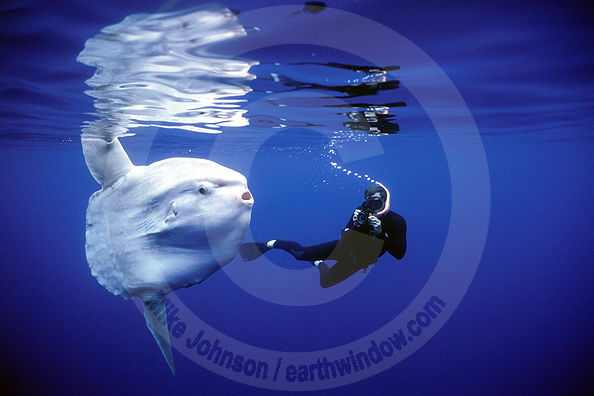 I also read they're called sunfish because they lie on their sides at the surface soaking up the sun. They area hazard to boats and can cause serious damage! I've seen a couple from the Flight Deck of the USS Nimitz (CVN-68) off of the So Cal Coast back in Aug. 1992. I'm sure if the Mola could talk, it would be something like, "DUDE--what gives!" Kinda like when an older sibling is hitting you with your own hand saying, "Stop hitting yourself!" Every time my wife and I see something about matinees I wince, "Okay, queue up that sad music, time to get depressed..." Gee-whiz, yet another creature humans smack into with their boats! I hope I can remember that bit of jargon/vocabulary you just laid on us daddio--I do like it! The good thing about the manatees JB is they have been taken off the endangered list. A couple of years ago I jumped into the water and was hanging out next to the swim platform waiting for a student to do a giant stride in. As I was floating there I saw a fin pop up about 5 feet away from me. I got that terrible feeling in my stomach that this was the end. I wanted to see it happen face to face so I dropped my head into the water I was relieved to see a mola mola rather than a shark.